TOKYO -- Catapulting forth continued U.S.-North Korea diplomacy, U.S. Secretary of State Mike Pompeo set his sights on high bar when he landed in Pyongyang on Friday morning: Specifying North Korea's commitment on denuclearization. This marks Pompeo's third visit to Pyongyang this year and it comes less than a month after the historic summit between President Trump and North Korean leader Kim Jong Un in Singapore. "On this trip, I'm seeking to fill in some details on those commitments and continue the momentum toward implementation of what the two leaders promised each other and the world," said Pompeo in a written statement. "I expect that (North Korea) is ready to do the same." Pompeo tweeted that he spoke with Mr. Trump, who offered a positive omen for the talks, while he was in the air. "The president told me he believes that Chairman Kim sees a different, brighter future for the people of North Korea. We both hope that's true," Pompeo wrote in the tweet. 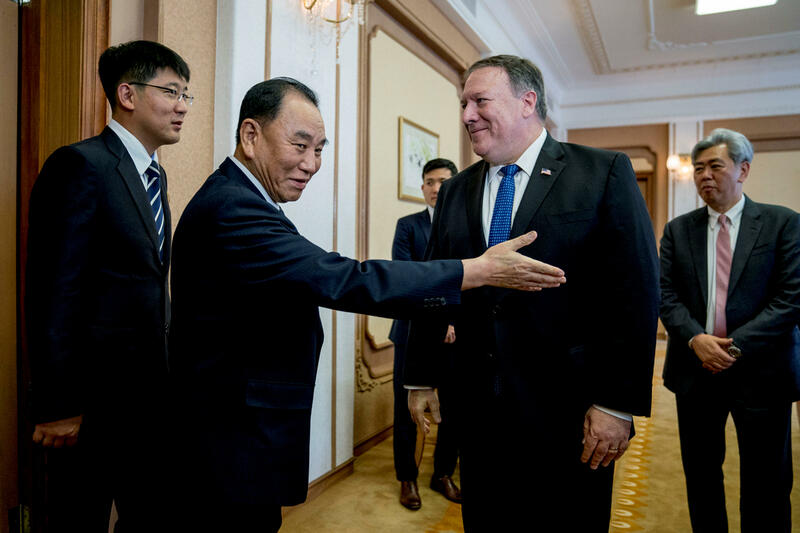 When Pompeo sat down for talks with Kim Yong Chol, a former North Korean spy chief who is now Kim Jong Un's top aide and de facto lead negotiator, he said he hoped the meetings would be "very productive." Kim Yong Chol said the more visits Pompeo makes to North Korea, the "more trust we can build between one another." The two men and their respective delegations met at a guesthouse complex in the North Korean capital. Kim Yong Chol visited the White House last month and delivered a letter to Mr. Trump from Kim Jong Un. That visit catapulted both Washington and North Korea to re-start the planning process for the Trump-Kim summit which had initially been called off by Trump. Facing reports that Kim actually is expanding his nuclear program, questions have arisen about the U.S. softening its stance on North Korea in terms of expectations on dismantlement. The State Department fired back, insisting "nothing could be further from the truth." "Our policy toward North Korea has not changed," said State Department Spokesperson Heather Nauert. "We are committed to a denuclearized north Korea and Secretary Pompeo looks forward to continuing his consultations with North Korean leaders to follow up on the commitments made at the Singapore summit." When the U.S. and North Korea concluded the Singapore summit, Mr. Trump declared that he and Kim developed a "very special bond" and Kim had committed to working "toward" denuclearization. The two leaders did not, however, sign off on any details as to how denuclearization would be achieved and monitored. The agreement signed by Mr. Trump and Kim left out the words "verifiable" and "irreversible" when referencing the denuclearization process. Pompeo said the word "complete" encompasses "verifiable and irreversible," and the lack of the two words was an argument over "semantics." Since the summit, North Korea has committed to returning the remains of possible American POWs in North Korea from the Korean War and to destroying their Ch'olsan County, North Pyongan province testing site. The regime, however, has yet to follow through on either of those commitments. Meanwhile the U.S. agreed to halt their joint exercises with South Korea. Many North Korean experts say steps need to be taken on both sides to build a sense of trust. For example, North Korea has not yet provided the U.S. with a list that divulges any specificities of their nuclear program. To start the process of denuclearization, the U.S. will need to compare the North Korea list to U.S. intelligence about the program, and then actually dive into denuclearization. As Pompeo sets out to specify what denuclearization means for North Korea, he could push for agreement which allows international inspectors to verify the North Korean suspension of nuclear and missile testing and a broad framework for how North Korea plans to freeze its nuclear program. Mr. Trump has cast U.S.-North Korea talks as already having achieved success. "If not for me, we would now be at War with North Korea!" he tweeted earlier this week. And after the Singapore summit, Mr. Trump tweeted that "there is no longer a Nuclear Threat from North Korea." That statement, however, alarmed some North Korea experts. They worried that a false statement about North Korea's nuclear capability would demean the Trump administration at the negotiating table. "Pompeo returns to Pyongyang under less than ideal circumstances. President Trump weakened the U.S.' negotiating position when he declared that North Korea was no longer a nuclear threat. And out of sync statements by administration officials on the goals and timing for next steps have made the negotiating environment even more uncertain," said Suzanne DiMaggio, a director and senior fellow at New America, a Washington, D.C. think tank. She added that Pompeo has an opportunity to bring "much needed coherence" to the negotiating process. Mixed messages have come from the administration as recently as this weekend. John Bolton, Mr. Trump's national security advisor, has said that "within a year" the bulk of denuclearization could happen while Pompeo previously set a timeline of two and a half years. "I'm sure that Secretary of State Mike Pompeo will be discussing with the North Koreans in the near future about really how to dismantle all of their WMD and ballistic missile programs in a year," Bolton said earlier this week on "Face the Nation." "Physically, we would be able to dismantle the overwhelming bulk of their programs within a year." Some North Korea experts also warn that Pompeo's ability to get into the details of denuclearization could be handicapped on this trip without a nuclear expert as part of his small traveling inner circle. This would lower expectations for any kind of agreement that Pompeo is able to pull off. "If you don't have the technical people with you, you can't negotiate. What Pompeo can do is deliver something and receive what they say and carry it home for study," said Charles Kartman, who served as the special envoy for peace talks with North Korea in the late 1990s and early 2000s and was the former director of the Korea Peninsula Energy Development Organization. Kartman also warns that negotiations with North Koreans that lead to mutual understanding on both sides will take a long time. "North Korea's whole concept of negotiations is to reveal as little as they can get away with. So you need a long slow exploration in which most ideas come from our side. Then you pick up on signals," Kartman said. He recalled that it took a long time during his experience negotiating with the North Koreans to figure out that food aid would be a key negotiating tool for the U.S. because it was something that North Korea really wanted during the time. Pompeo will begin his visit in Pyongyang over lunch with Kim Yong Chol, a former North Korean spy chief who is now Kim Jong Un's top aide and leading negotiator. The diplomat visited the White House last month and he delivered a letter to Mr. Trump from Kim Jong Un. That visit catapulted both Washington and North Korea to re-start the planning process for the Trump-Kim summit. Pompeo will also be meeting with Kim Jong Un. He plans to spend the night in Pyongyang, then will head to Japan for talks with Japanese and South Korean officials about the visit. Pompeo will be in North Korea for a day and a half. He is also expected to meet Kim Jong Un. Upon departure from Pyongyang, Pompeo will head to Japan for talks with Japanese and South Korean officials about his visit to the North.